Together with PE “Rider Pro” we did a new design on a totally new technological level. Clock is driven by precision mechanism for tower clock from the Czech Republic. The accuracy of the time is provided by synchronizing the clocks via GPS, the accuracy of the temperature measurement – by the special sensor located on a nearby building. By using LED lighting and display with adjustable brightness depending on the ambient light we managed at the same time to increase the brightness, readability and drastically reduce energy consumption. After installation of the first embodiment of a thermometer it was decided to change its appearance. It should be noted that there were no complaints regarding the technical side and electronic of the thermometer remained unchanged. 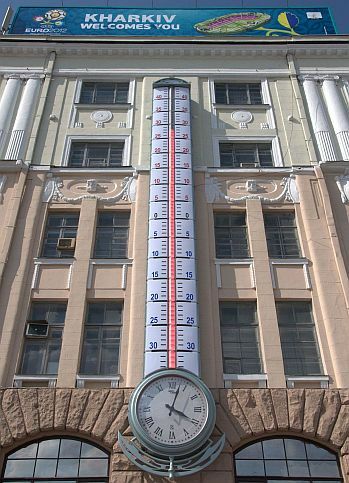 Despite the protracted work because of reconstruction of the facade of the building before the start of EURO 2012 thermometer was installed in its final form.